How are your stage lighting control skills and knowledge right now? Do they include a strong busking element or is this something you’d like to get a whole lot better at? BUSK201 is a step up from beginner level BUSK101 course, and actually quite a significant one. Upon completion, you will be ready for pretty much anything when it comes to designing and implementing a busking setup. 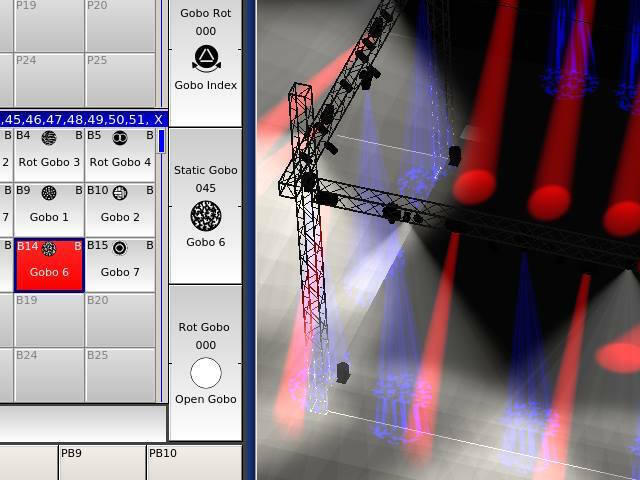 You will leave the course better equipped for this enjoyable style of stage lighting control than many people working in the industry right now! The course starts in February and runs over a 10 week timeline with 4 different units plus a final assignment. This gives you the chance to complete the work at a pace and schedule that fits around your other commitments. The BUSK201 content is a comprehensive tour of busking strategies, tools, and workflows, and enables the learner to design and use their own busk file. The course demonstrates specific ideas using the free Cham Sys MagicQ software and visualiser but the learning is applicable to all professional grade lighting controllers. Design and program a busking setup suitable for a wide range of performances. Use the busking setup to respond to multiple stage lighting situations. For a fictional multi-genre festival, you need to design a busking setup for a range of incoming acts that include both concert/DJ and theatre performances that runs over a number of days. On this occasion, you will have little time for any artist-specific programming or rehearsal and will have to rely on being able to respond to all of the shows in real time. You will have access to some snippets of information in advance, an example piece of text from a rider or some suggested cues from one of the artists. Most of the acts will provide no information at all other than a genre or name, so your setup needs to be prepared to provide appropriate lighting based on what is happening on stage. Based on a fixed rig design, your busking show file will provide you will all the tools you need in order to run all the shows to a good standard within the preparation limitations you are working under. You are also restricted to using 2 pages of 10 playbacks and 48 Executors. You will choose and implement different busking strategies and develop the file around the existing rig and the wide range needs of the festival. This online course is taught asynchronously over the lifetime of the course through a combination of original digital content, online interaction and the course tutor (me). This means that you do not have to worry about scheduled session times or time zones. Each unit is released upon completion of the previous unit including a short assignment, culminating in a final assessment which presents the evidence of your learning. For the final assignment, your final show file will be demonstrated to the tutor through a 30 – 40 minute digital viva at a mutually convenient time using Skype, Hangouts, TeamViewer or other similar means. The full cost of BUSK201 is £220.00 GBP, great value considering the outcome for the learner. This is the first time the course is being run and we tend to be cautious on pricing for new courses to prove their value. This means that the course is never going to be cheaper than it is right now. There is a limited number of places on BUSK201 but you can books and pay right now, securing your place. Once you are an enrolled course member of the Learn@OnStageLighting platform, you will also have access to a new raft of exclusive free learning content that we will be rolling out over 2018. So not only will you get the course now, but also member benefits in the future. The cost is £220 GBP and you can book and pay by credit card or using Paypal. You can find the course listed as one of our Lighting Micro Courses and joining the course is easy. The deadline for joining this course is Friday 2nd February 2018 and enrolments will close after that date.